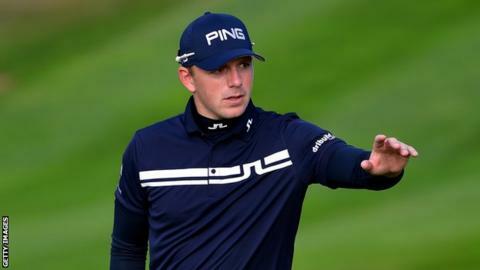 England's Matt Wallace recovered from the disappointment of missing out on a Ryder Cup wildcard with a good start at the Omega Masters in Switzerland. Wallace, 28, won the final qualifying event in Denmark but was overlooked by European captain Thomas Bjorn. He shot a two-under-par 68 to lie four behind Germany's Maximilian Kieffer in Switzerland, with compatriot Andy Sullivan one off the lead after a 65. "I'm disappointed because that was my goal and my dream," he told Sky Sports. "I thought I showed enough on the Sunday in front of him to get a pick." Kieffer had seven birdies and dropped just one shot in his 64 as he chases a maiden European Tour title in his 162nd event. He holds a one-shot advantage over Sullivan, Dane Soren Kjeldsen, France's Julien Guerrier and Japan's Hideto Tanihara.